In this design, you could notice that no space was wasted. Lots of shelves and drawers to keep everything in one place. I also love it's contrasting color! Maybe because I'm a big fan of orange. 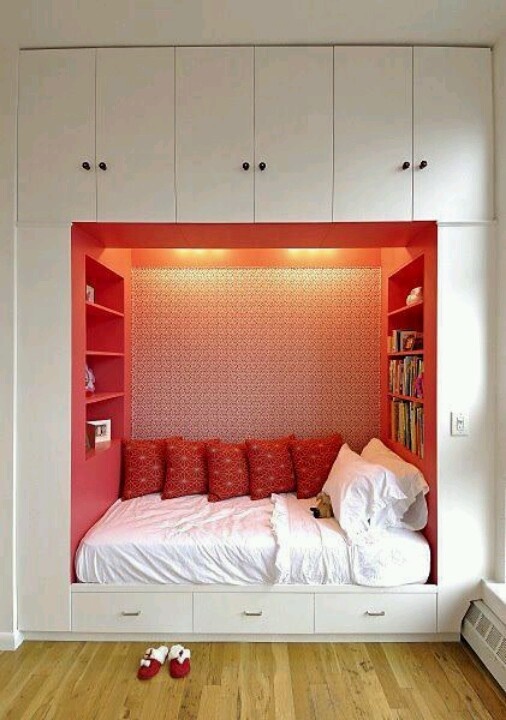 :) If you have 2 kids and there is a need for them to share a bedroom, perhaps this bed space design can give both of them some privacy. It can be installed on both ends of the room and the central area of the room can be as a work space where study tables can be placed. You may also want to add up a seating area in the middle which would served as a divider between the two bed spaces.